The fully compatible components contained in the backpack make using the B-Safe Roofers Kit not only safe to use but safe to carry - hands free to assist access. The Kernmantle rope used in conjunction with high strength grab provides positive location and free movement when required - no more birdsnesting in 3 strand rope. Harnesses and shock absorbers are highly rated - meeting the requirements of AS1891.1 - all harnesses also proof loaded prior to packaging and have 160kg capacity. Kit is 100% visually inspected prior to packaging. 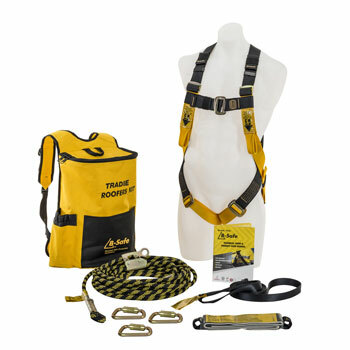 B-Safe Tradie Roofers Kit is ideally suited for work on most roofs when used in conjunction with appropriate anchorage. We recommend all users be fully conversant with competencies for working at height contained in AS/NZ 1891.4.